When Prime Minister Matteo Renzi stepped down, Italy was sent back to the drawing board. But there’s no alternative to reform: The current course, inside or outside the euro, is not a viable option. What went wrong? After months of discussions over the pros and cons of a constitutional change to make Italy’s political process more efficient – a change that had the business world’s seal of approval – voters said no. A heated national debate ended in a resounding defeat for Prime Minister Matteo Renzi on December 4 of last year, and three days later he was forced to resign. Once again, Italy was left with a new government – the 66th since the end of World War II. But the failed proposal and the reasons it fell apart have been swiftly swept under the rug. In fact, complete silence has settled over the country. Renzi’s aborted reform plans are no longer discussed at all, as though the referendum never even happened. The parties that once supported the reform plan have returned to their traditional infighting, and the word “reform” has been stricken from the political vocabulary. In the meantime, lawmakers have been consumed by a new voting law and potential dates for a new election. The clear 59.1 percent majority against Renzi’s reform plans may have been influenced by the Brexit vote and the US election, but there was also a uniquely Italian dynamic at play: Renzi had lost sight of growing social inequality and failed to understand the degree to which young Italians reject his policies, especially those who had suffered the most under the ongoing financial crisis. 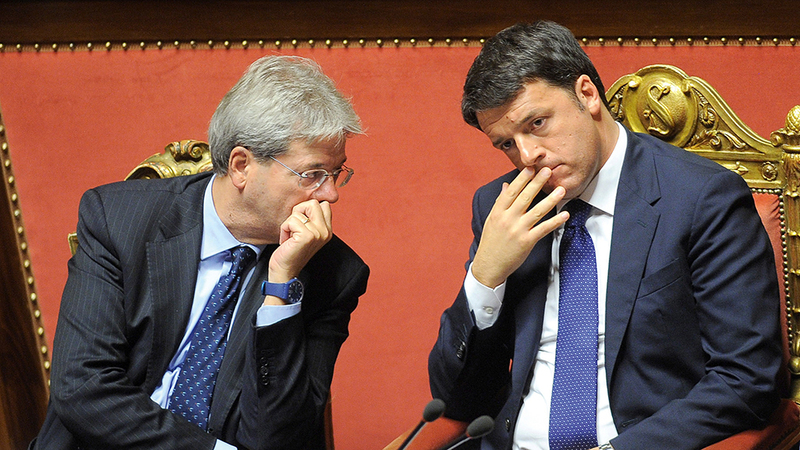 For them, it wasn’t a matter of constitutional reform – their vote was meant as a wake-up call for Renzi. Italy has lost its chance at a new beginning and rejected a constitutional reform that was fundamental to the health of the economy. The country is “too big to fail” – too large and important as the third-largest economy in the eurozone and ninth-largest industrial state in the world to be allowed to collapse. While Greece is responsible for two percent of the economic capacity of the eurozone, Italy contributes 16 percent. The reform aimed to make administrative structures more flexible, legislative processes faster, and the political world more stable; it would have made Italy’s economy more competitive on the international stage. Instead, the economy is stagnating, the banking sector is in crisis and public debt is staggering. Yet the outbreak of the disease began long before Renzi entered office in February 2014; the country’s recent problems merely represent its recurring symptoms. In reality, Italy has been suffering from weak growth, antiquated structures, and pernicious corruption for a long time. Italy’s recession lasted three years after the start of the financial crisis in 2008 and had disastrous consequences. GDP has plummeted by eight percent, per capita income has fallen ten percent since 2007, and productivity is a quarter of pre-crisis levels. At the same time, debt has increased and the unemployment rate has fallen only marginally. Youth unemployment was still 40 percent as of December. The crisis decimated the once-strong middle class, and growth has stagnated. Renzi does not deserve the blame for these developments, but he did not manage to improve the situation either. Italy simply has not managed the transition into the modern era. In fact, the economy has lacked dynamism for some thirty years now. Real growth sank from 2 percent in the 1980s to 1.5 percent in the 1990s and 0.6 percent in the first decade of the 21st century. The largest economic contraction came in 2012. Now, deflation and weak domestic demand continue to stifle growth even further. It’s a vicious circle: Sinking productivity and competitiveness demand higher public debt, which increased to €2.21 trillion in 2016. The EU Commission has demanded sustainable budget consolidation and doubts Italy’s willingness to cut expenses. And it’s no wonder the Commission is worried – if Italy cannot get its debt under control, the existence of the euro itself is under threat. The emotionally-charged word “flexibility” has dominated the headlines for months now. In 2016 the EU Commission granted Rome a few exceptions as a one-time measure. In its 2017 budget, Italy designated certain expenses – including the costs of the continuing refugee crisis and the 2016 earthquake – as special expenditures and raised its deficit repeatedly. A culture war broke out between Europe’s North and South. Rome blamed austerity policies for limiting its growth while Berlin and Brussels criticized Italy’s unwillingness to cut expenses and the government’s ad hoc approach to economic policy. The problems with Italy’s ailing banks are especially troubling. It is a sector that has avoided modernization for years; Renzi summed it up when he said, “There are too many banks.” Too many banks, too many branches, too little efficiency – for every million inhabitants, there are 502 bank branches, well above the European average. The problem stems from Italian mentality. Particularly in smaller villages and rural areas, businesses rely on personal contact, but this can have negative consequences. When the credit unions were saved in 2015, small savers lost their money because they trusted their personal advisers without reading the fine print on their accounts. There are many reasons why the banks find themselves in this state – the macroeconomic environment currently affecting all European banks, the negative interest rate limiting profitability, the 2016 earthquake – but there’s one problem unique to Italy: bad loans. In total, the banks have amassed a record €360 billion of them. Italian bank supervisors blame the recession for exacerbating the situation. It has become difficult for many companies to pay back their loans, according to Ignazio Visco, governor of the Banca d’Italia, and banks have had to take necessary precautions to ward off further disaster. But the process of restoring the banks’ health has taken too long. Carmelo Barbagallo, head of the Banca d’Italia’s directorate general for financial supervision and regulation, says the number of bad loans is gradually sinking, but the IMF and the European Banking Authority have observed Italy’s attempt to work through its mountain of bad debt with growing concern. The institution with perhaps the greatest problems is Banca Monte dei Paschi di Siena. Founded in 1472, it lost roughly 60 percent of its value on the Milan stock market in 2016. The Siena institution was the worst-performing in Europe in the ECB’s stress test and at €24.2 billion has the highest amount of non-performing loans on its books. Key investors, such as the sovereign wealth fund of Qatar, have withdrawn their funds, and shortly after Renzi’s resignation the final taboo was broken: the state stepped in to rescue the bank. According to EU rules established in the beginning of 2016, this should no longer be possible. However, Rome invoked exception clauses and pointed at the bank’s systemic role. For weeks now, the rescue package of €20 billion has been ready and waiting in a drawer at the ministry of economy and finance. In retrospect, it is clear that Renzi spent far too long passively observing the disaster unfold. He sat on the sidelines until Monte dei Paschi was nearly insolvent in order to escape the anger of the small investors (and voters) who would be forced to shoulder the bailout. Today, banks are working to modernize themselves – but as in other industries, that can mean the elimination of jobs. And different industries have experienced vastly different rates of success when entering the global market. Some, like companies that deliver cars for the automotive industry, have been overwhelmingly successful in carving out niches for themselves; others have had more difficulty, due to insufficient innovation, development, strategy, or simply foreign language capability. “Businesses need to be able to rely on a modern institutional order, otherwise investments won’t come in,” says Boccia. With the referendum, they would have had it. In addition to a long tradition of clientelism, Italy has been plagued by corruption and mismanagement, tax dodging, and a significant shadow economy. Financial regulators are taking their work seriously; the new Italian National Anti-Corruption Authority (Autorità Nazionale AntiCorruzione, or ANAC) has so far been successful – and yet there are daily media reports of new cases of corruption or abuse of office. The “Tangentopoli” bribery scandal uncovered extensive corruption in Italy’s highest offices 25 years ago, yet today, according to a poll conducted by the institute Demos & Pi, 86 percent of Italians believe corruption to be as ubiquitous in politics now as it was then, especially when it comes to procurement. And beyond corruption, the country’s bloated bureaucracy and outdated justice system practically demand that businesses flout the rules. The Renzi government attempted to reduce the role of public administration by reorganizing the provinces, but the task proved Sisyphean in a country that praises the clever hustler who clocks in every morning and then goes to take care of other business outside the office. Resistance against any sort of change to increase efficiency is substantial. Business requires faster reform of the justice system, both in civil and criminal law. At the moment, a judgment is only valid after three instances and often takes over a year to reach. According to the EU Commission, since 2014 an average of 500 days pass between the beginning of a civil trial and a decision. In criminal cases, the statute of limitations often runs out before a judgment is handed down. Scandal-prone former Prime Minister Silvio Berlusconi was one of the greatest beneficiaries of this system, escaping countless times from tax evasion, corruption, perjury, and abuse of office charges. He was only once convicted, and even then escaped with nothing more than house arrest and community service on account of his age. Faster legal proceedings would also be a draw for foreign investors. A new law extending the statute of limitations, however, is stuck in parliament – and the ongoing electoral campaign prevents any serious legislative work. Not everything is going wrong in Italy. Minister of Economic Development Carlo Calenda pointed out, “We are in fifth place globally in terms of trade surplus, and set an export record of €414 billion in 2015. Many of our businesses are integrated into the global supply chain.” When it comes to structure and competitiveness, the northern parts of the country are not so different from Germany’s most successful states, Bavaria and Baden-Württemberg. “Made in Italy” is a sure-fire success – the luxury sector is booming, and not only major fashion brands, but also the leather, design, food, and wine industries are doing well. Even in metalworking and electronics there are countless small and medium-sized enterprises that are fast becoming global leaders. The shift of Italian industry over the past decade into machine construction, robotics, and pharmaceuticals has strengthened connection to Germany, the country’s most important trading partner. German companies have 2950 branches in Italy today. Meanwhile, Calenda has been undeterred in his emphasis on Industry 4.0, and industrial leaders like Alberto Bombassei from Brembo, a manufacturer of brakes systems, consider him “the right man in the right position.” Italy will make further gains as business and consumer confidence grow. Renzi was accused by his opponents of pursuing political rather than structural goals, but his reform report card – with the exception of the referendum – isn’t bad at all, especially his modernization of the labor market in the face of massive opposition. This reform is not yet finished, though; bankruptcy reform and a competition law are still pending in parliament. Italy can count among its virtues creativity, a knack for innovation, and quick problem-solving abilities. The Italians are adaptable and flexible in crises, and they possess a great deal of individuality and loyalty to their local region, rather than to the state. Their private saving rates are high compared to the European average. These are all factors that could help Italy manage a new beginning. The country has gotten by so far, though it is losing time. Italy seems to be experiencing the bumblebee paradox: According to the laws of aerodynamics, a bumblebee should be too heavy and its wings too small to fly – nevertheless, the beating of its wings produces a large vortex that generates enough lift to keep the insect afloat. Two possibilities still frighten investors. The first is a further advance of Beppe Grillo’s Five Star Movement. The euroskeptic party is nipping at the heels of the governing Partito Democratico (PD) in the polls. In 2016 local elections they took over city halls in Rome and Turin. But their victories are costing them, especially in the capital: the politically inexperienced and scandal-plagued mayor Virginia Raggi appears to be completely overwhelmed. And then there’s the specter of an “Italexit”, or Italian exit from the eurozone. The American Nobel Prize-winning economist Joseph Stiglitz set the tone of the international discussion: “Italians are starting to realize that Italy doesn’t work in the euro.” And former Chief Economist of Deutsche Bank Thomas Mayer agrees. “Should Renzi lose on December 4, Italy may set a course for an exit from the currency union,” Mayer predicted. That is not, however, the picture so far in 2017. Economic numbers are slowly beginning to improve, and Renzi’s temporary successor, Paolo Gentiloni, is concentrating on fighting poverty and creating social solidarity. As its first act in office, the government issued a decree to implement school reform and marriage equality, and negotiated an aid packet for southern Italy. Another earthquake in central Italy early this year, however, put the government back in crisis management mode. Whether Grillo and his party manage to pull off an upset, or whether Renzi returns to implement further reforms, one thing is evident: the era of clear majorities is over. There will be long coalition negotiations, as no political party is currently capable of governing alone. Italy is suffering from a case of “vote-itis,” says Giuseppe Vita, president of Unicredit bank and chairman of the supervisory board of Axel Springer – all the more reason for electoral reform. is Italy correspondent for Handelsblatt. She lives and works in Rome.